IVI drivers provide many capabilities that go beyond those of VXIplug&play drivers. The IVI specifications have been developed to enable drivers with a consistent and high standard of quality, usability, and completeness. The specifications define advanced features such as instrument simulation, state caching, automatic range checking, and multithread safety. IVI custom specific drivers support only inherent capabilities and instrument specific capabilities that are not standardized by the foundation and that are unique to a particular instrument. Inherent capabilities are described in IVI 3.2: Inherent Capabilities specification, available on the Specifications Page. In addition to these inherent and instrument specific capabilities, IVI drivers can comply with an instrument class specification to support the foundation’s goal of instrument interchangeability. IVI class-compliant specific drivers contain inherent capabilities, base class capabilities, as well as class extension capabilities that the instrument supports. Base class capabilities are common to most instruments in a class (e.g., edge-triggered acquisition on a scope). Class extension capabilities represent more specialized features of an instrument class (e.g., TV or width trigger on a scope). To achieve interchangeability, users program to an IVI class interface available through an IVI class-compliant specific driver or a separate IVI class driver. To support all popular programming languages and development environments, IVI drivers provide either a IVI-C or an IVI-COM API. Driver developers may provide both interfaces, as well as wrapper interfaces optimized for specific development environments. 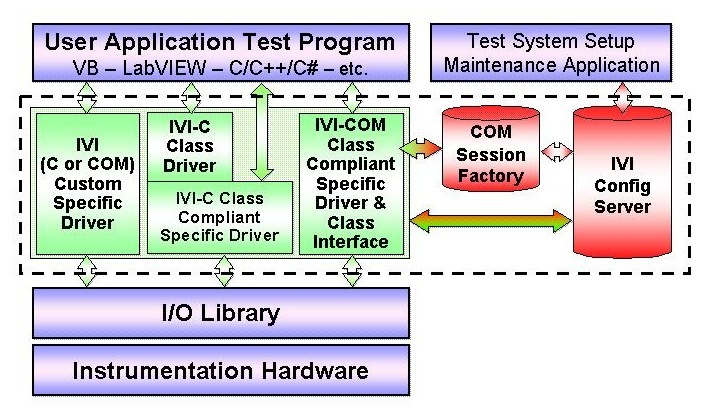 All IVI drivers communicate to the instrumentation hardware through an I/O Library. The VISA library is used for the GPIB and VXI buses, while other buses can either utilize VISA or another library. IVI Foundation members have cooperated to provide common software components, called IVI shared components, that ensure multi-vendor system compatibility. These components provide services to drivers and driver clients that need to be common to all drivers. For instance, the IVI Configuration Server enables administration of system-wide configuration. To learn more about IVI driver architecture, see the IVI architecture specifications, available on the Specifications page.